How do they celebrate Christmas in Russia? In Russia the Christmas holidays run from December 31st to 10th January, with Christmas Day being celebrated on 7th January. Why 7th January and not 25th December? Well, not all countries adopted the Gregorian calendar at the same time. 25th December according to the Julian calendar falls on 7th January according to the Gregorian one, so strictly speaking they are celebrating 25th December – it’s just that they go by a different calendar. On Christmas Eve (6th January) many Russians fast until the first stars come out. They attend church services and afterwards have a meal called “Holy Supper” which consists of 12 dishes to represent the 12 apostles. Some of these dishes are fish, borsch, dried fruit and a porridge-like food called ‘kutya’ which is eaten from a shared dish to represent unity. After the meal they will go back to church for another service known as the All Night Vigil. Christmas in Russia is primarily a religious occasion. The decorated trees and present giving traditions are all for New Year’s Eve. This is because during the days of communism, religious celebrations were banned and so Christmas wasn’t celebrated at all. So that they didn’t miss out, the Russians moved all the party traditions to New Years Eve, and this date is now far more important to the Russians than Christmas day, and is the day when families get together to celebrate and exchange gifts. The children, who would have been visited by St Nicholas pre Soviet Union, now receive their presents from Grandfather Frost (Ded Moroz) and his granddaughter The Snowmaiden (Snegurochka). 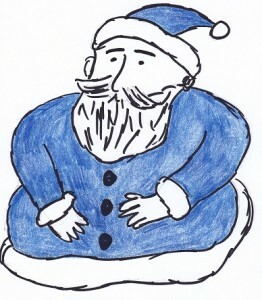 Ded Moroz looks much like Father Christmas except that he wears blue, not red, and carries a magic staff. He gets around by sleigh just the same.